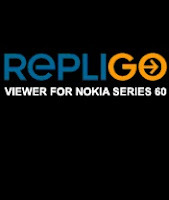 Repligo viewer is a mobile ebook reader for reading ebooks on mobile phones. it can be downloaded from http://www.cerience.com for free. A lot of ebooks can be downloaded from the internet an read on the go. If you want to convert your own files into repligo format you can do that by downloading a trial version from the website mentioned above. a license will be needed to use its full functionality. Repligo converter can convert .pdf, .html, .txt, .doc and many other format into .rgo format. The viewer is good reader for small screen and ebooks can be read without much strain on the eyes.